What do we know about these breast cancer biomarkers HER2-Neu Estrogen Receptor Progesterone Receptor? What do we know about these breast cancer biomarkers: HER2/Neu, Estrogen Receptor & Progesterone Receptor? Breast cancer is the most common amongst all cancers that afflict women. It was estimated that in 2017, about 30% of all newly diagnosed cancer in women were breast cancer. Although men are significantly less affected by breast cancer, poorer prognoses is typically seen due to delays in detection. Breast cancer development occurs when genetic material in breast tissues mutates and/or signaling mechanisms are dysregulated. Frequent causes for these developments can beaging, hormone imbalance, and genetic inheritance. In recent times, diagnosis efforts in genomic testing have been developed for cancer screening and predicting drug treatment outcomes. However, traditional methods such as immunohistochemistry (IHC) on biopsied samples are still very popular and have proven to be reliable as well as less expensive. One common pattern seen in breast cancers is abnormalities in receptor status. Noteworthy classes are human epidermal growth factor receptor 2 (HER2/Neu), estrogen receptor (ER), and progesterone receptor (PR). Significant functions of these receptors involve upregulating signal transduction pathways, gene expression, cellular proliferation, and cell survival. Many breast cancers also display high levels of overlapping expression between these three classes. The type of expression pattern is significant as it determines tumor aggressiveness, drug treatment plan, efficacy of treatment, and survival odds. HER2/Neu, or human epidermal growth factor 2, is part of the epidermal growth factor receptors family, usually functioning as receptor tyrosine kinases. Similar to its other members, HER2/Neu signaling is involved with cell growth and differentiation. However, mutation or expression changes can result in ligand-independent firing from constitutive dimerization. 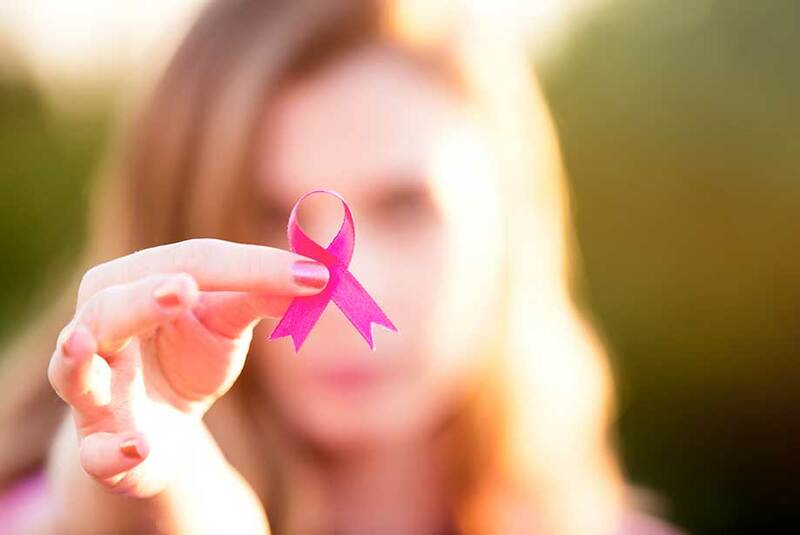 Approximately 20-30% of breast cancer tumors are known to overexpress HER2/Neu, with around 50% of this population also displaying upregulated estrogen or progesterone receptor expression. 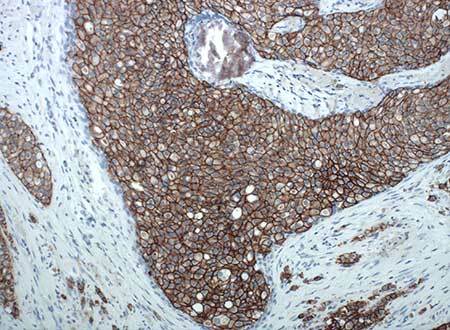 The HER2/Neu antibody can be used to qualitatively identify the expression of HER2/Neu at the protein level in FFPE tissue using IHC test methods. HER2/Neu testing by IHC can aid in identifying cancers of the breast and gastric systems, determining prognosis, and establishing treatment suitability for Trastuzumab in patients with breast cancer. Overexpression of the HER2/Neu protein has been associated with aggressive forms of breast cancers, as well as pulmonary and gastric carcinomas. Concomitant overexpression of HER2/Neu and p53 has been linked with early invasion and metastasis in bladder cancer. Figure 1: HER2+ breast cancer tissue incubated with HER2/Neu monoclonal antibody (ENZ-ABS381) and then stained with POLYVIEW® PLUS (anti-Mouse) HRP-DAB Kit (ENZ-KIT160). 1: 50 dilution; IHC staining was performed on an automated Leica Bond III. While immunohistochemistry and fluorescence in situ hybridization (FISH) are commonly used to detect HER2/Neu, efforts have been made to look for alternative assays. Since HER2/Neu extracellular domains tend to be shed into the bloodstream by tumor cells, blood serum analyzed by ELISA is currently being investigated as a less invasive alternative. In terms of therapeutics, one of the leading treatments for Her2/Neu positive breast cancers is Trasctuzumab. Approved by the FDA in 1998, Trastuzumab is a humanized monoclonal antibody known to target the Her2 receptor and upregulate expression of p27 and p21 to prevent G1/S cell cycle transition. Estrogen receptor, or ER, is known to have 2 variations. Nuclear estrogen receptor binds to estrogen after diffusion through the plasma membrane and dimerizes. This dimer complex proceeds to bind onto DNA hormone response elements and induces changes in gene expression profiles for activities such as promoting cellular differentiation. On the other hand, membrane estrogen receptors are located on the cell surface and are generally G protein-coupled receptors. Ligand binding alters cell signaling through downstream kinase signaling cascades as well as enhancing cell proliferation and cell survival. Relative to estrogen receptor, one of the most common dysregulated pathways in breast cancer involves the dimerization of cyclin dependent kinases, noticeably CDK4/6 through the activation of cyclin D1. Nuclear estrogen receptor dimerization is known to activate this process. However, a dysregulation is a key indicator for breast tumor genesis and can be seen in the early stages of developing tumors. Approximately 70% of breast cancers display over-expressed estrogen receptor. Similarly, 65% of ER + diagnosis overlap with progesterone receptor overexpression as well, which encourages screenings for ER and PR to be conducted together. A frequently used drug is Fulvestrant, which serves as a selective estrogen receptor degrader specific upregulated ER+ in breast cancer. Inhibition mechanisms are known to prevent dimerization of nuclear estrogen receptors and increase degradation. Alternatively, Tamoxifen is also used extensively as an estrogen receptor modulator for blocking. A common feature shared between these treatment plans is their dependence on estrogen receptor positive screenings, reducing their efficacy significantly if ERs are not present. Progesterone receptor, or PR, can also be found intracellularly as a nuclear receptor. When not bound to its associated ligand, it is usually inhibited by its own carboxyl-terminal to prevent DNA binding and transcription. As mentioned previously, it is common to see the estrogen receptor and progesterone receptors co-expressed in breast cancers. Progesterone receptors can be upregulated as part of the estrogen receptor pathway. Because of this, seeing progesterone receptor positive subtypes expressed alone are rare. Recent studies have also shown a possible role progesterone receptors plays in modulating estrogen receptor action. In one study, progesterone stimulation was shown to alter the gene expression profiles of estrogen receptors and produced increases in cell cycle arrest, inhibited tumor growth, and displayed sequestration of the estrogen receptor complex. Future studies involving progesterone endocrine therapy appear to delve deeper into this relationship as well as into finding therapeutics that display improvements on survival outcomes. Despite significant progress in determining the role and treatment options for these three breast cancer markers, significant lingering questions remain. Estrogen receptor positive detection is a good predicative biomarker for those who will benefit greatly from associated hormone treatment. However, the value of progesterone receptor selection in endocrine therapies remains controversial and requires much further study. The significance of estrogen receptor and progesterone receptor co-expression groups are not well established for the prognosis of drug treatment plans. Some data currently suggests that progesterone testing is not even warranted as there is little to no correlation in detection of PR + and the efficacy of other drug therapies. Furthermore, HER2/Neu positive or negative status can change over time as seen where 13.9% of a 255 woman biopsy study displayed these changes. Interestingly, the identifiable ligand(s) for HER2/Neu are not well known at this time. This is in stark contrast to other members in the epidermal growth factor receptor family which have at least 1 known ligand discovered. While most breast cancers are known to express one of the three receptor types (HER2/Neu, PR, or ER), it is also possible to receive a triple negative diagnosis where none are deemed overexpressed. Approximately 10-20% of these triple negative diagnoses can in some way be traced back to the BRCA1 gene. Other instances have shown overexpression of other receptors involving prolactin or androgen. Treatments usually involve chemotherapy after surgery. However, the triple negative pathology has been shown to resurface after a duration of time. There are currently no targeted therapies developed for triple negative resurfacing at this time. Enzo Life Sciences provides a wide range of products for all your cancer research needs. Our HER2/Neu monoclonal antibody provides a cost-effective opportunity for strong, clear staining with minimal background. Accompanying this are Enzo’s immunohistochemistry reagents, which provide a complete set of tools for an efficient IHC process from start to finish. Enzo’s SCREEN-WELL® Cancer Library provide a unique collection of 275 compounds. Furthermore, our FISH reagents provide everything you need for labeling, hybridization, and detection. For questions on any of our products, please contact our Technical Support team. Unique high definition black IHC chromogen for HRP-activated development. Unique high definition blue IHC chromogen for HRP-activated development. High definition IHC chromogen producing brilliant green color for AP-activated development. High definition IHC chromogen producing brilliant red color for AP-activated development. Unique high definition yellow IHC chromogen for HRP-activated development.